Technicolor Kitchen - English version: Apple and cinnamon hot cross buns for Easter + "Soul Kitchen"
Apple and cinnamon hot cross buns for Easter + "Soul Kitchen"
Someone told me once – and I hate it that I cannot remember who it was – that I would love “Soul Kitchen” because it is a movie about a restaurant and there was food involved; since watching the excellent "The Wave" I’d become more interested in German movies, so I rented “Soul Kitchen” and yes, it is a movie about a restaurant and there is food involved, but it’s so much more than that: to me, it’s about relationships and how they affect people’s lives. “Soul Kitchen” is full of funny elements – Zinos’ ringtone being one of my favorites – and yet it brings up more dramatic subjects, many of them some of us can relate to: Zinos’ struggle to maintain the restaurant, his need to decide between being with his girlfriend and staying where he feels he belongs to, the brother who causes nothing but trouble (and is a gambling addict, no less)... All of that mixed with images of whipped cream, lamb chops, white chocolate and vanilla beans – I loved it and have added other movies by Fatih Akin to my “to watch” list. Start with the compote: combine sugar and water in a medium saucepan, then squeeze in juice of half the lemon and stir over medium-high heat until sugar dissolves. Meanwhile, cut remaining lemon half into 3mm-thick slices, add to saucepan with Granny Smith apples and cinnamon quill. Bring to the simmer, reduce heat to medium and cook until lemon and apple are translucent (20-25 minutes). Strain, reserving fruit and syrup separately. When cool enough to handle, dice lemon, combine with apple. Remove the cinnamon quills, add them to the syrup and set aside. Combine flour, raisins, dried apple, yeast, ground cinnamon, allspice, zests, sugar, apple compote and salt in a large bowl and make a well in the centre. Combine milk and butter in a small saucepan, warm over low heat until butter melts and mixture is lukewarm. Whisk in egg, then add milk mixture to flour, stirring to form a soft dough. Turn onto a lightly floured surface and knead until smooth and elastic (8-10 minutes) – I used my Kitchen Aid with the dough hook to knead the dough; gradually added 1/3 cup flour because the mixture was too wet. Place in a lightly buttered bowl, cover and stand in a warm place until doubled in size (30-40 minutes). Meanwhile, line a large baking sheet with foil. Knock back dough, divide into 20 even pieces, then knead each piece into a smooth ball. Arrange dough in a large rectangle, placing balls side by side onto prepared sheet, leaving 1cm between each for dough to expand. Cover with a tea towel and stand in a warm place until doubled in size (30-40 minutes). Preheat oven to 220°C/428°F. Combine the 1/3 cup extra flour and ¼ cup (60ml) cold water in a bowl and stir to a smooth paste. Spoon into a piping bag fitted with a small plain nozzle and pipe a cross shape onto each bun. Bake for 10 minutes, reduce oven to 200°C/400°F and bake until golden and buns sound hollow when tapped (10-12 minutes). Meanwhile, combine reserved syrup and cinnamon quill in a small saucepan and stir over medium heat until syrupy. Brush thickly over hot buns, then transfer to a wire rack to cool. 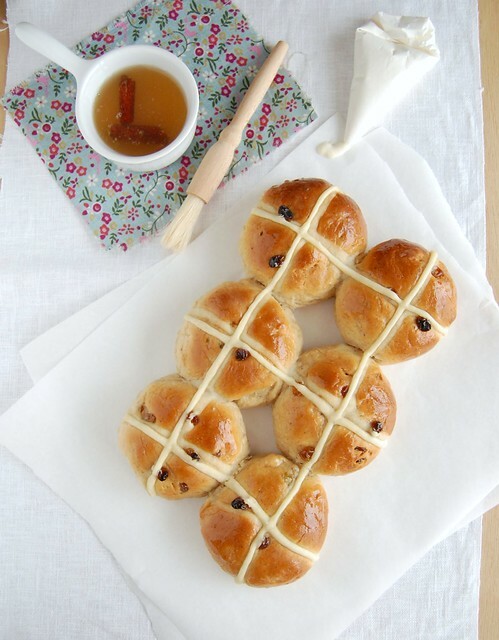 Your hot cross buns are picture perfect! They look delicious ! And now I want to know more about this movie !! I love the movie Soul Kitchen! :) Your hot cross buns look and sound amazing, I love apple-anything. Looks delicious! Love your your recipes! I have been visitng your blog for quite some time (never left a comment before) and every time I'm amazed at your beautiful pictures. Thanks so much for sharing the recipe. I'm in the middle of making these for Easter breakfast tomorrow - so far they look amazing! My only question is whether you have the recipe for the icing shown in the photo...? Thanks! Martha, thank you for your kind words, I appreciate it!